When I lived in Odessa, Ukraine, I once encountered a most strange cat. Odessa used to have a huge open air book market, right in the middle of the city. Kind of like a much larger and organized version of the street booksellers in front of NYU. Me and my dad spent a lot of our time and money there. On one of our trips, my dad pointed out a cat sitting in a tree near the book market. On a number of our visits there that stretched over weeks and months, the cat was still there. Water and food dishes appeared there. Somebody told us that the cat apparently went a bit crazy and refused to leave the tree (even though it wasn’t a very high one). Kind hearted booksellers started to feed the cat. I am not sure exactly how long the cat stayed in the tree, or if he or she ever left it. New York has strange cats of its own. Subway cats. 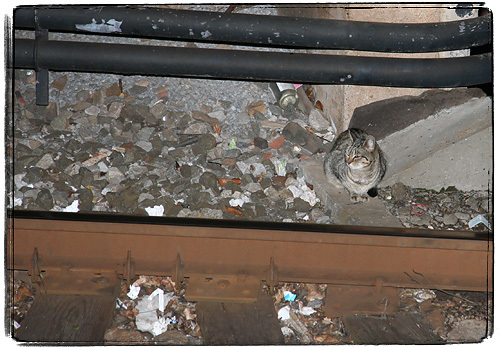 The most famous one of those, Schatzie the cat that lives in the Fulton Street station, according to Randy Kennedy’s book “Subwayland : Adventures in the World Beneath New York.” The mice and rat population must make living near the deadly third rail and moving trains possible for cats. Sadly, eating those rodents must be pretty dangerous too, because they are frequently poisoned. 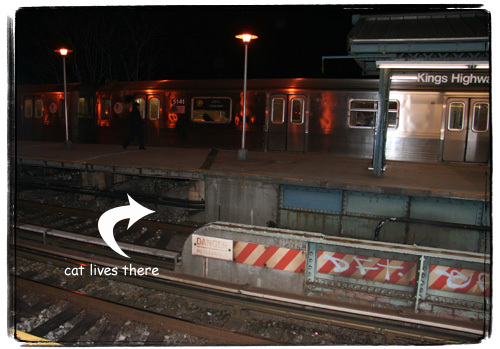 Well, I found a subway cat of my own under the platforms of the Kings Highway station. Actually I spotted two, a tabby and a tuxedo, but was able to take a picture only of the tabby. She sat there calmly, not bothered by my flash. I hope she’ll stay safe there.